Thank you Deb so very much for sharing this with us! Most of my Japanese indigos in the garden and in the pot have bjuds on their stalks – are they useless for dyeing? Impressive as always! My JI came from John’s seeds sent to me from someone on the dyers yahoo group. but arent doing great. Since I wasnt sure on growing time I put them in a pot. Mehhh. They are a single stock, no blossoms, about 14 in high after all summer. On the indigo FB group I got the idea that it likes acid soil, so I put coffee grounds around the plants. They perked up. We are going into fall in Arkansas so I’m going to try bringing the pot indoors . If they fail I will need seeds! Last year my irrigation system failed so I had a complete crop failure…..fortunately John M and someone from Iowa gave me seeds so I had a crop this year. I have pink blooms and white blooms from the two sources…same leaf, just different blooms. Good luck! Thank you for the in-depth details of this process! It sounds daunting, but the color is a rich reward for the effort. Deb, this is a fabulous post! Thank you for taking the time to document your process and unselfishly share with the rest of us. I am saving for the future as I am growing a few seeds – maybe by next year! I would be so happy just with the leaves for Eco printing experiments. Again a big thank you! Yes, Deb. I’d heard that John Marshalls recipe was the one, but it’s great to see it in action. I have this year’s harvest of dried leaves – what I couldn’t use fresh. Would love to talk more about this via email. This is great! I want to know how to do this without the thiorea dioxide. Anybody know? Nope, don’t know how yet, when you extract the fresh leaves you put a high ph in some form (soda ash or slaked lime) and add oxygen. You then “reduce” with thio or fructose or madder. That will be a path for next year’s crop. I want to test the known dry recipe with increased leaf ratio for now. Deb, thank you so much for the detailed post how did this! hank you! I will buy John Marshalls book when it becomes a little cheaper, he has done a wonderful work when researching and trying out japanese methods with japanese indigo, that kind of information seems to be all new to the western world like this dry leaf method. it makes me wonder how much new (or old) things can be still found in Japan or China, which we know nothing about. When I read how you did the extraction from the dry leaves it started to make sense to me. I don’t know if I’m right but it seems that when the leaves are dried the indigo precursors in the leaves break down and oxidize attaching to the leaves (when they turn blue). 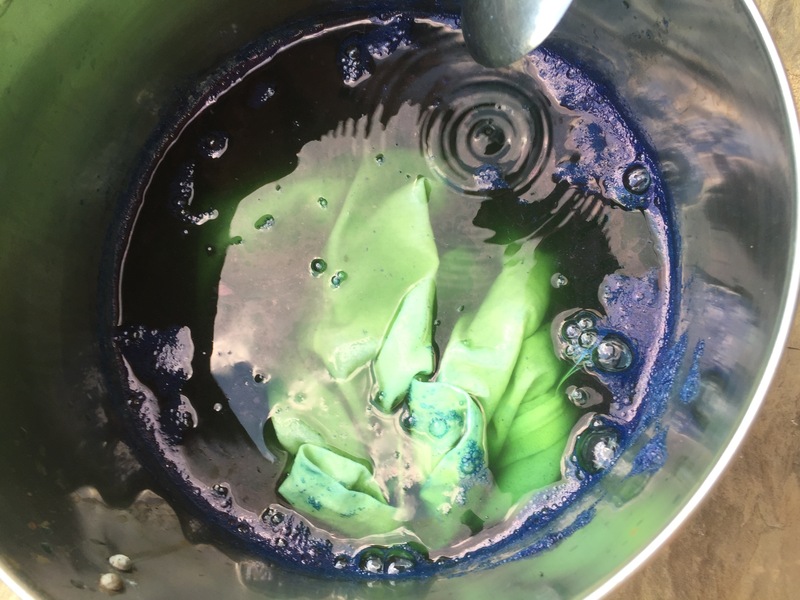 It may be that the precursors of indigo in japanese indigo are sensitive to boiling (and that is why when you extract the normal method they can’t stand too high temperature) but when they are oxidized to blue indigotin in the leaves then they are not (like you can boil garment dyed with indigo and it stays blue). 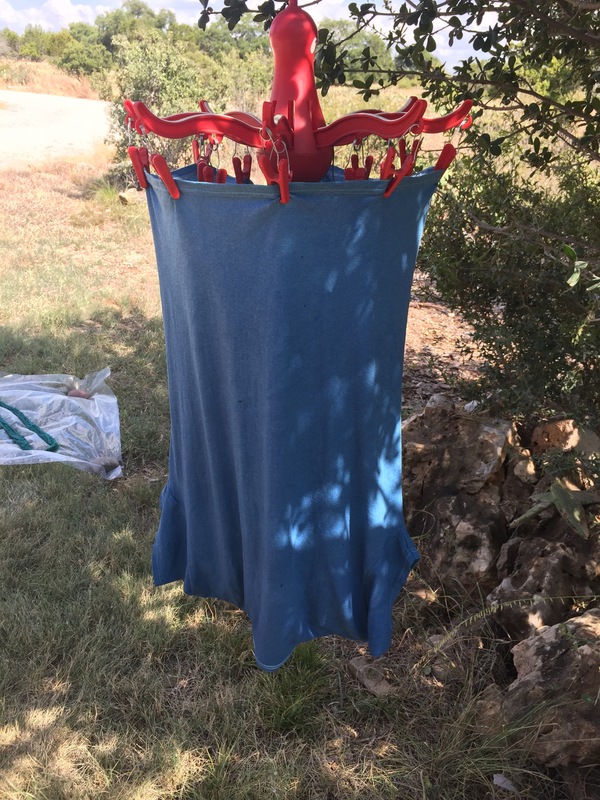 What you did was kind of stripping the indigo from the leaves the same way as you would do when you want to strip the color from indigo dyed fabric (in a bath with high pH and with reducing agent). Does this make sense or what do you think? 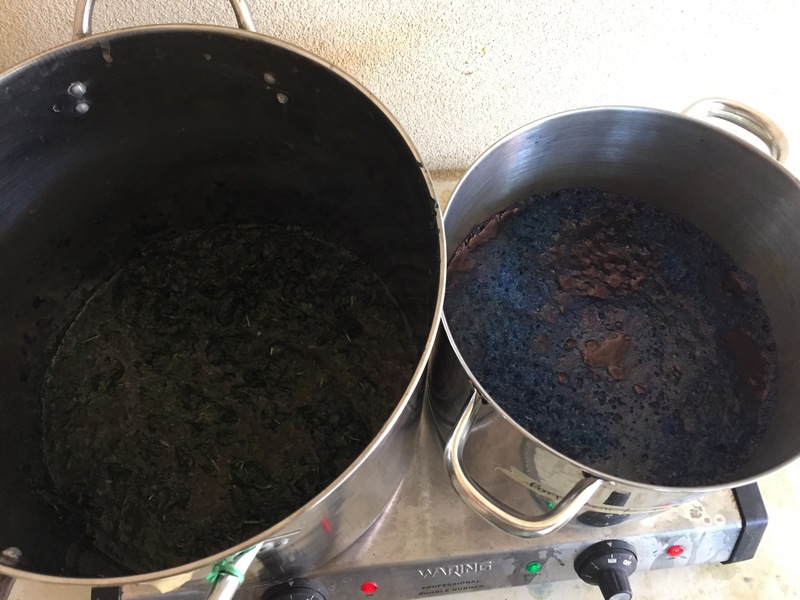 If you would just simmer the dry leaves without alkaline and reducing agent the indigo would stay in the leaves. I still wonder about the high temperature because Lilies says that in reduced state indigo is sensitive to higher temperatures than 60C, but it seems that in this case he is wrong as what you did worked! 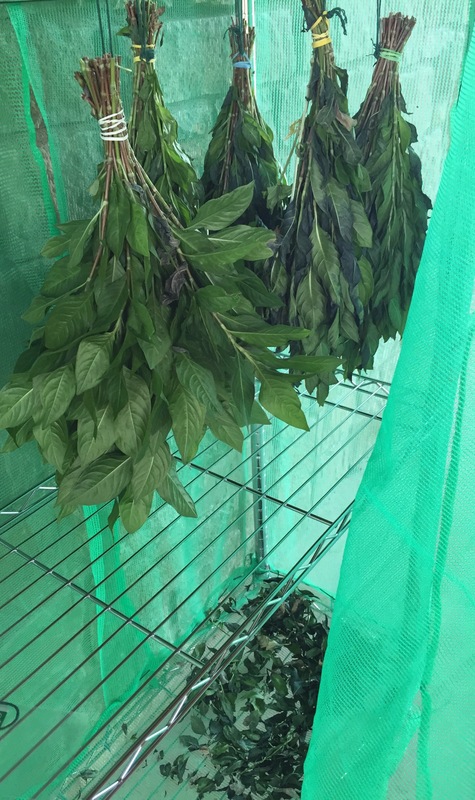 I have now harvested most of my japanese indigo, but I have a little left (perhaps 3-4 kilos worth of fresh leaves), I will dry them to experiment with this method. You plants have grown really well. 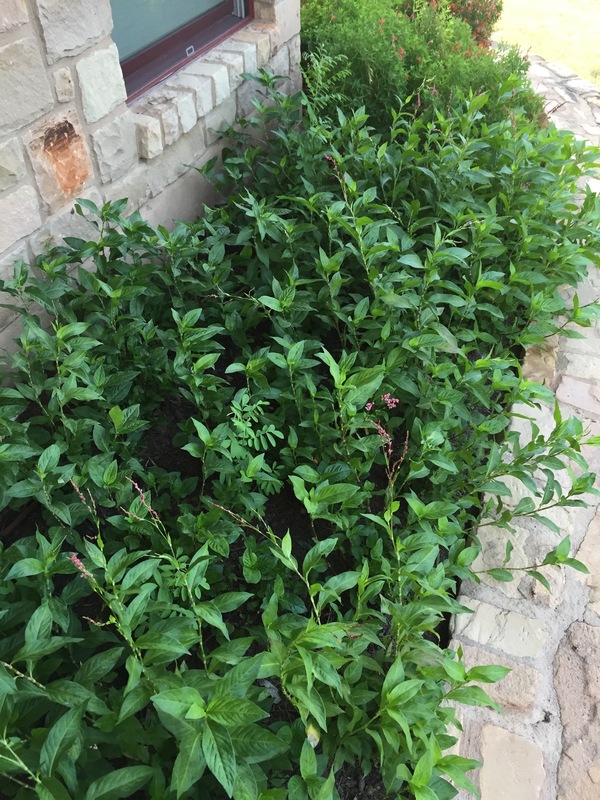 I plant mostly 2-3 plants in one place, so I can’t say how many stems would come from one plant, but I think that when there is only one plant at a place and it has room and water and nutrition to grow it is as good or even better than growing many plants in one place. I get about 300grams of stripped fresh leaves from one group of 2-3 plants grown together. Thank you again for putting all this information in this post! Deb, I so appreciate you sharing this method. We were always told not to dry our indigo leaves, that they had to be used fresh. This method certainly proves that theory wrong. My indigo plants are all harvested for this year, so maybe I can try it next year. I was very happy when John Marshall unlocked the dry leaf method. Still needs to be experimented with for depth of color BUT we know it works! Hi, thank you for the link to this over at IndiGrow fb group. I’m wondering about the thiox being introduced while cooking the leaves. Doesn’t a lot of oxidization happen when doing the series of extractions and pours? Obviously it worked. I’m wondering if you could do the extraction with just the soda ash and add the thiox afterwards. That might lessen the smell vapors. So many great things to try. Now I’m happy I have some dried leaf. Thanks, again. Michele, good suggestion, worth a try. One must extract the indictin from the leaves and then reduce it. John’s Japanese method appears to do it all at once.This is all new to me. I’m always pro one-pot methods out of laziness, but I also like an experiment, so I might try both. Now I wish I saved more dried. Hi. Love your work and the fact you share. 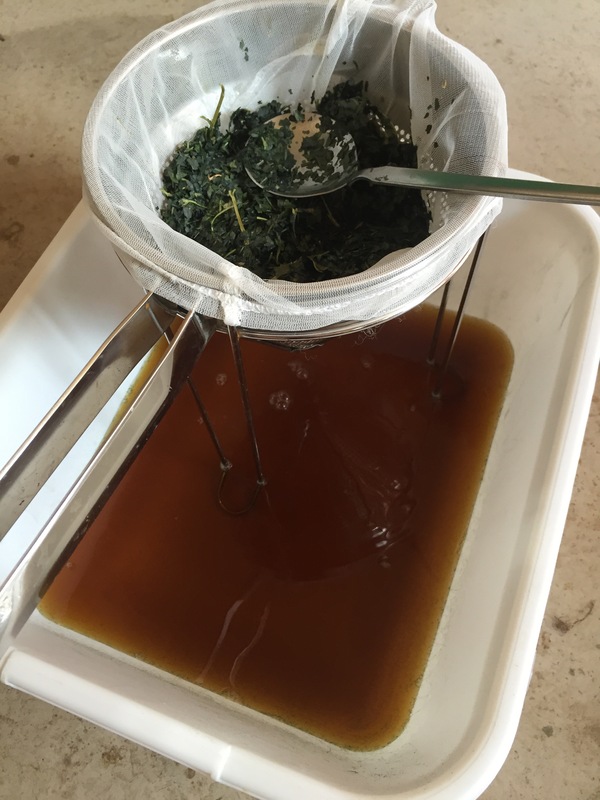 Have you tried the dry leaf with a fructose or ferrous vat method? I’ve been using both methods with powder extracts in six gallon vats. I keep,them heated to 90 degrees with fish tank heaters. They still drop in pH every night and it takes hours to revive. I’ve spiked vats with Thiox and they are ready in minutes. Curious to learn how dry leaf work in organic vats.. I’ve got 15 lbs of it from last summer saved for classes. We are in serious drought this summer! Harvest looks bad. Thank you, I have not tried the fructose or ferrous vat method with the dry leaf. It is on my list of things to try. I will report on my blog when I do try it. I wandered off on another path with my fresh indigo suffrucitosa and fructose. It is good to know about the ph drop….I’ve run into the same thing with my IS and the fructose pot. Thank you for sharing that info. Debbie, I grew some Japanese indigo, and harvested it in the rain the other day. Then I dried it and stripped it. Today, I could not find your instructions so I found some other online which said to heat the leaves in water for a couple of hours, up to 160 degrees. 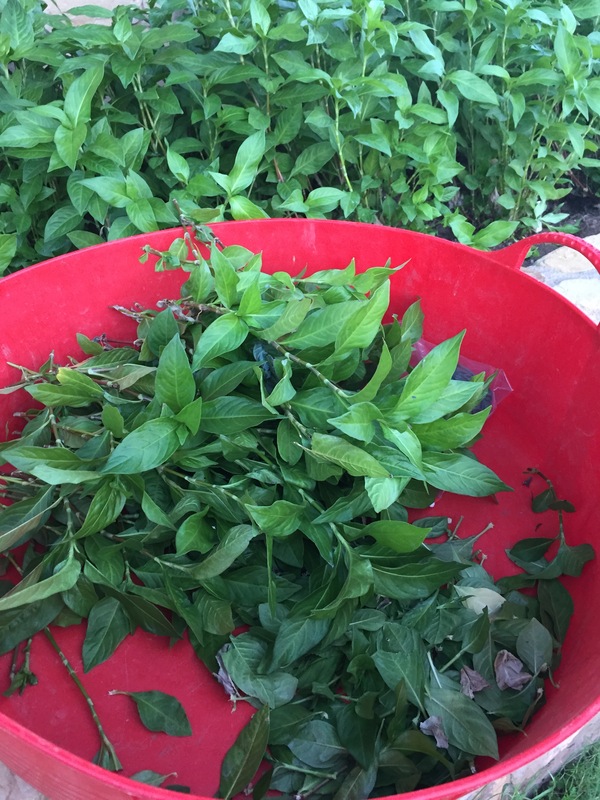 then to strain the leaves, add soda or ammonia to the water, and pour back and forth between two buckets till it turns blue, …. I added washing soda and have been pouring for quite a long time now but the tea is only a dark murky yellow. Will it ever turn blue? I am not sure how to go forward. Can you give me any advice? Should I discard this liquid and try to get something more out of the leaves. I have saved them. Or shall I just forget this whole batch and start again? I still have a pretty good crop remaining and expect what I cut to regrow between now and winter here in Brenham, but I would like to get some dye out of this effort if I can. I have my fiber skeins washed, wet, and waiting. Sounds like you did not reduce the oxygen. Did you add thio, fructose, henna or madder root to kick off the oxygen reduction? Your indigo will just float around and wave at you rather than striking your yarn. You are correct, I did not add anything except washing soda. The instructions said oxygenate the liquid till it turns blue then add the color remover. It never turned blue. Once I found your instructions for dried indigo it said heat the leaves w water and then pour off that yellow liquid and then start within the strained leaves. Now I’ve had to travel out of town for a week so I left the strained leaves spread out on trays, and that yellow liquid is in a bucket which I thought I should ask my husband to pour out. It sounds like you are working with the pre-reduced indigo. I am sorry I can’t help you with that. Oh, dear, I don’t know what is pre-reduced indigo. I picked the leaves, dried them, covered them with water, heated them for two hours up to 160 degrees, and strained the liquid. Then I added soda to the strained liquid but it never turned blue. I saved the leaves. Should I try adding more water to the leaves to extract the indigo or is there hope for the first yellow liquid I poured off? Below is a very good book that has great instructions. You can try again with your liquid when you get home. Try pouring back and forth again and then add your reduction agent. That is what you missed the first time. The bath shoukd be at a temp of 100-120. Good luck! This is very fun. I’ve always enjoyed your write-ups and photos about dying and now I have done it myself! Thank you for your help. okay, Virginia, I am officially confused. 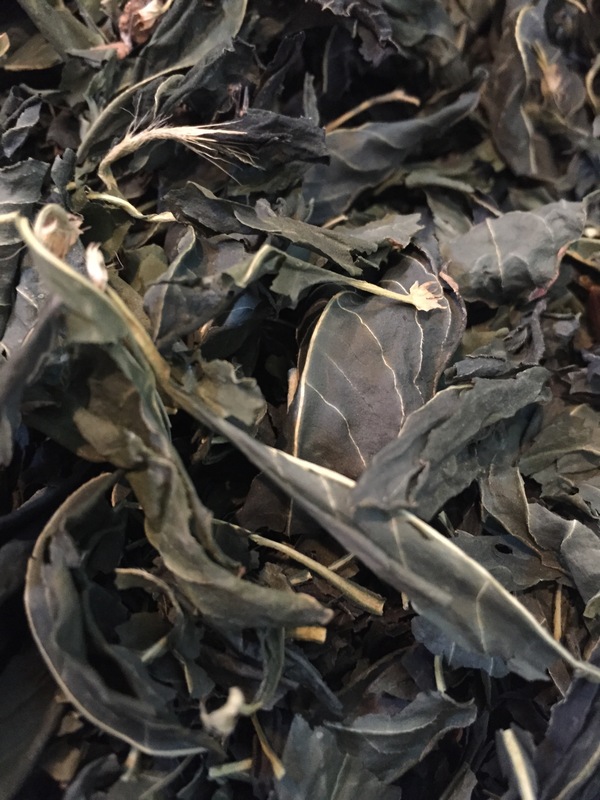 Are you working with fresh Japanese Indigo leaves or with dried Japanese Indigo leaves? Rita’s book gives you the directions for working with FRESH leaves. 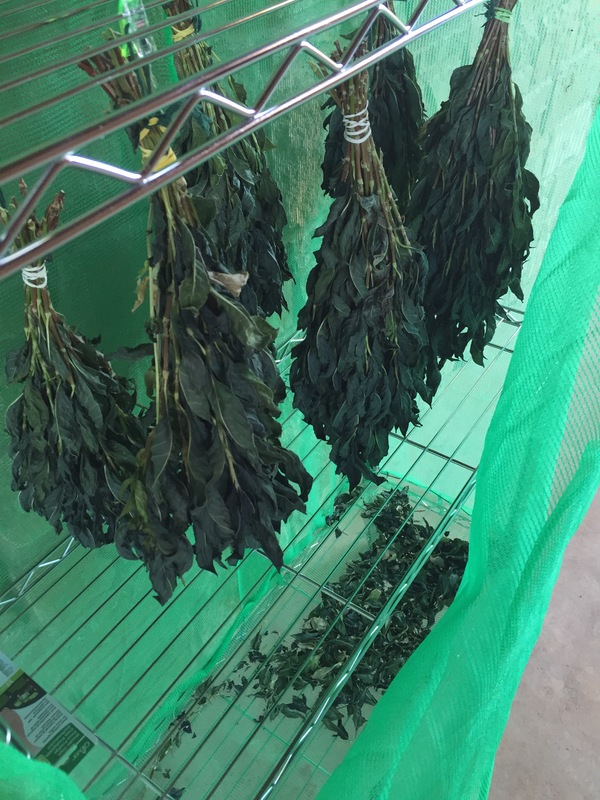 My blog entry gives you John Marshall’s translated Japanese process with DRIED leaves. There are different process steps dried vs fresh. And of course there is the blender recipe that works with fresh leaves and is ANOTHER process. That is why I am asking. No criticism implied, just trying to clarify! 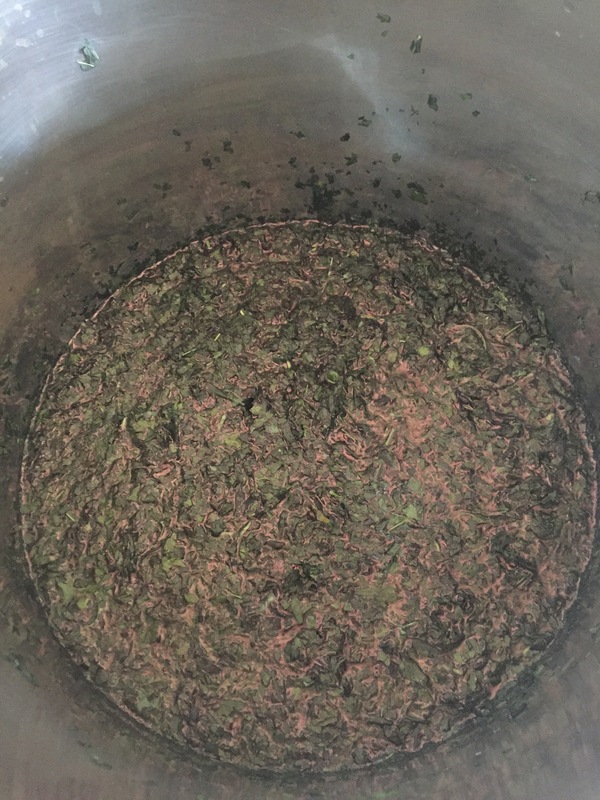 Hi, Deb, on my first try, I dried the leaves for a few days, as I thought I read in your post, but then I couldn’t find your page, for some reason, and so followed some other instruction — and heated the leaves for a few hours but not over 160 degrees. I strained the leaves and poured the liquid yellow-brown liquid back and forth but it never turned blue so I never added the color run remover which I had bought for the purpose. I kept the leaves but ended up throwing out the liquid which became moldy while I was out of town for a week. Today, I started over and used fresh leaves according to Rita’s directions. It has worked as I described in my earlier post. Tomorrow, I will try again with another batch of fresh leaves and over-dye the skeins I dyed today. — Unless you have other advice. I am open to any suggestions. I have a pretty good patch of remaining indigo though it is mostly flowering now. I am reading in Rita’s book I can boil the used leaves for some yellows and browns, but for the moment I was interested in the indigo color. 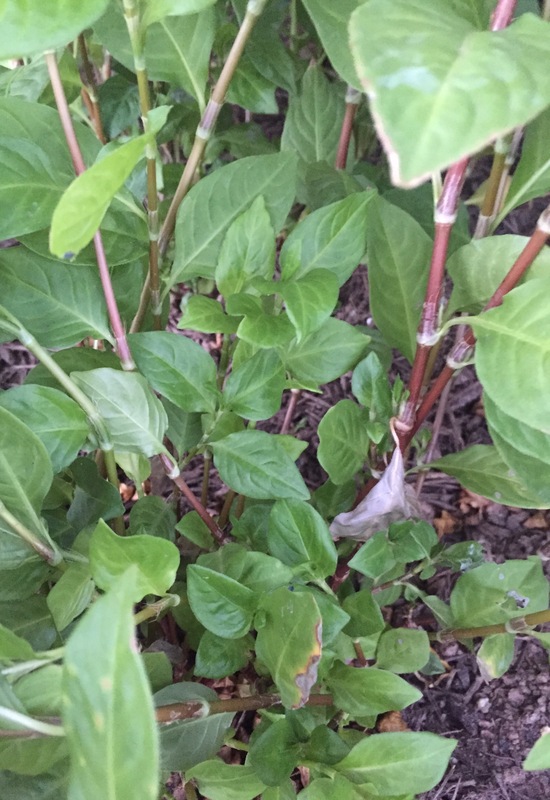 Ok great, fresh leaves, follow Rita’s instructions, they work well. Your skeins’ colors will deepen to blue. You are seeing the chlorophyl which will disappear. 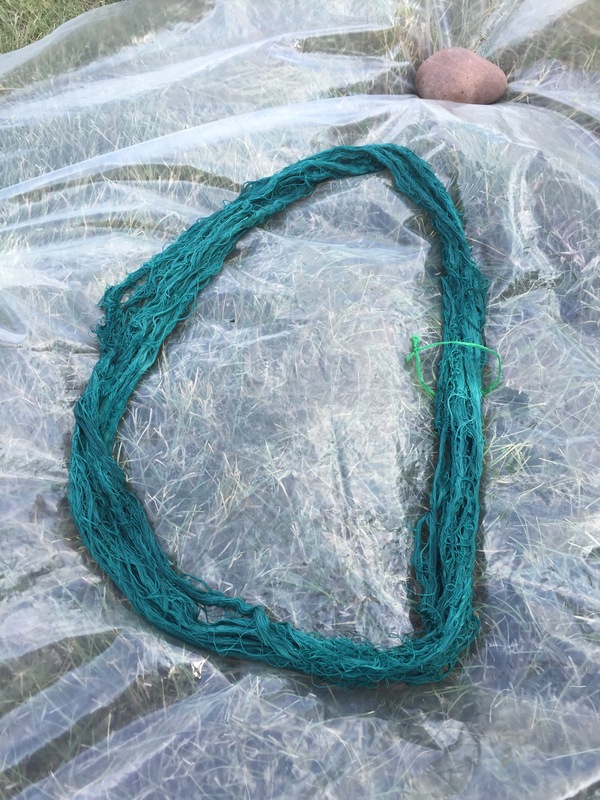 Hold aside one of your indigo skeins and use the “used” leaves for a yellow overdye. You can get a yellow skein, a blue skein and a green skein if you plan out your order of dyeing. Three colors from your indigo! There is always next year’s crop! 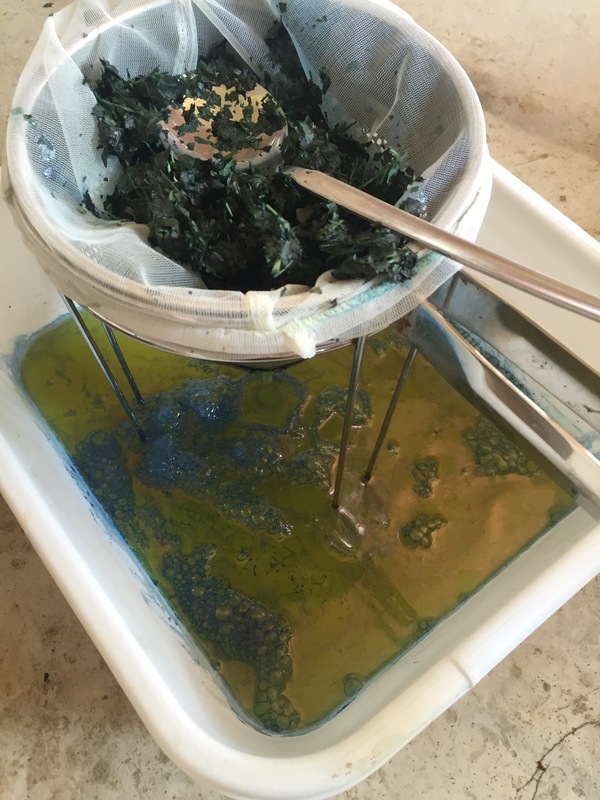 Oh, and actually your color after pouring back and forth might be a port color…the blue green color is from the indigo tinc species (can’t remember official name. Anyway note the color you started with and watch for the color shift. I was reading your directions for using the dried leaves. I really like the idea of being able to dry the leaves snd use them when you want to. I will collect the various ingredients and try this as soon as I can. Do you think it is worth my while to dry leaves from plants that are flowering? I will have more seeds than I need so that is not a concern for me. Yes! Mine worked last year. This is good news. I will harvest and dry some now and then another “crop” when this one grows, back before cold weather sets in. Deb, I tried to distill your instruction into something like a recipe that I could print out and reference. If you have time, would you take a look and make any corrections? I put my questions in red, but I may have made mistakes elsewhere, too. no attachment to look at, not sure if you can post an attachment to my blog. Hi, Debbie, today, I re-dyed two of the skeins that had been dyed a few days ago, and here is a photo of the result. I thought you might find it interesting. The 85% cotton+15% linen skein turned a darker, truer blue. The 100% silk, which had turned gray after the first attempt, turned a nice brown this time — not blue as I had hoped, but interesting and not a bad color. Next I am going to dry the leaves and work from that. 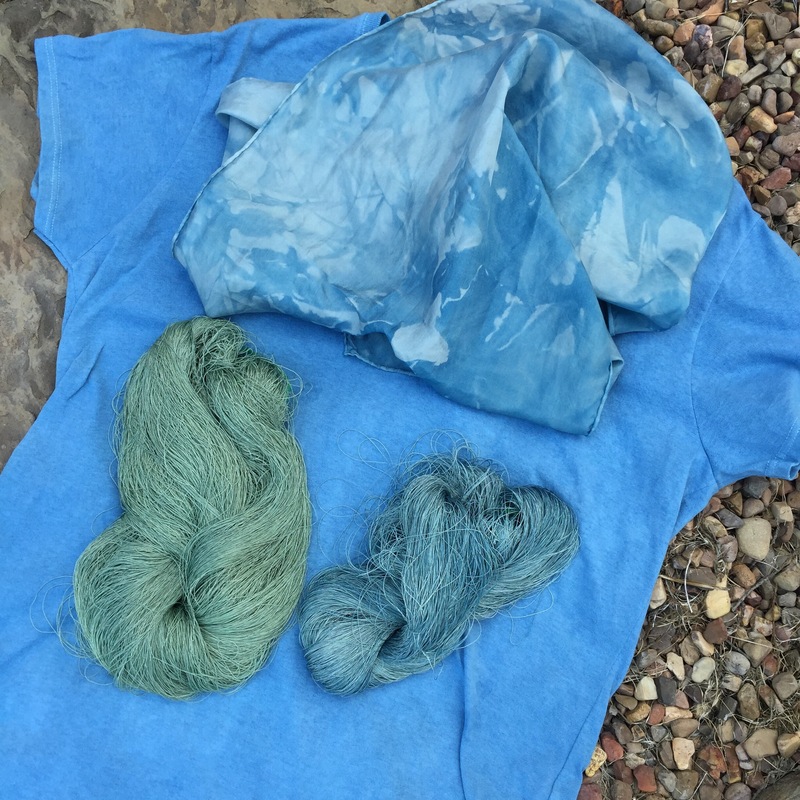 In October, I am going to take an indigo dyeing class at WC Mercantile in Navasota. I am sure that will provide more information for me to work with. no photos attached, not sure if you can put photos in the comments, I’ve had the brown and grey before also, seems to be related to the temperature of the indigo pot, between 100 – 120 degrees….enjoy your class in Navasota! Towards the end of the season there is less indigo but give it a try. No problem, thank the Japanese dyers that wrote about & shared the process and John Marshall for translating the process from Japanese and publishing it. 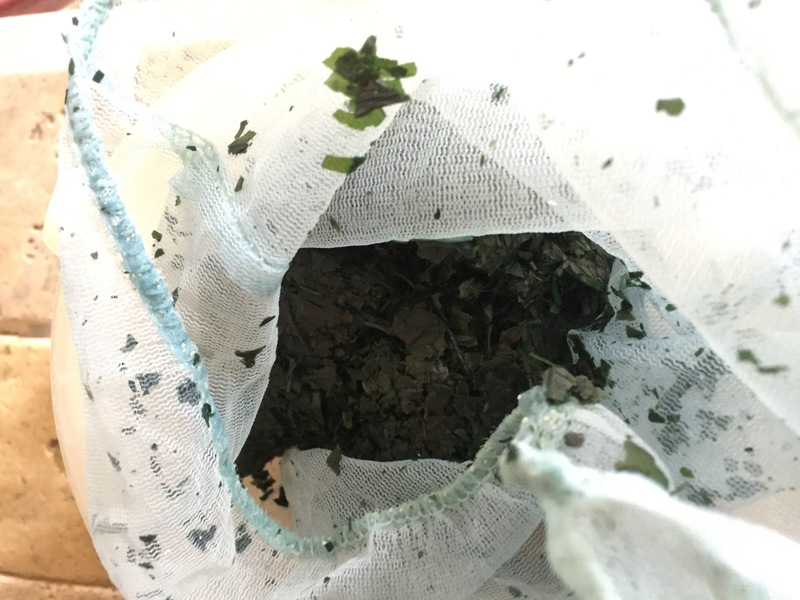 I tried your Recipe using my Dried Japanese Indigo leaves. The only difference in recipes was I used Color Run Remover rather than the Thiorea Dioxide, and got no bloom, and no color in my yarn. Any ideas what I did wrong?? Thanks for walking us through your exploration of using your own indigo and for the recipe and references. Fascinating to me, a newbie to creating my own vat. I’ll hunt up John Marshall aslnd have a bit more courage in doing my own. The first time you strain the yellow liquid it is discarded. The next two times, that liquid is discarded too? Finally ready to try this! Only the first time is the discard! The next pulls hold the liquid for your dyebath!